What do you think? We would particularly love to share with our online visitors any stories that former members of the WAAF and WRAF may have; and if you are a woman who is currently serving in the RAF we would welcome your insights into today's service. To share your stories with us and the public or if you are an online visitor who would like to comment about this exhibition, please email research@rafmuseum.org. We look forward to hearing from you. My sister was one of first to join the WAAF. Her name at the time was Kathleen Kiddier she was stationed at Wittering and was a plotter there. She is now 90yrs old (memory not so good) so I thought I would enquire if anyone knew of her or may have a relative who may have known her. I served with the WAAF, initially as a Filter Room Plotter at 10 Group, Rudloe Manor, then on being commissioned as a Filterer Officer, I was at 9 Group, Barton Hall, Preston and finally at Fighter Command Headquarters, Bentley Priory, Stanmore. In November 1945, I together with several other Filterers were sent to 33 Wing, 2nd TAF at Malines in Belgium to work out the trajectories of the V2 Rockets being launched on Antwerp. After VE day, I was sent for some time as a guide and interpreter to Breendonck to show RAF personnel what happened at this concentration camp. After a post-war career as a hotelier, I am now retired, living in South Wales. The Unknown Story of The Filter Room of Fighter Command. figures - and female". These were the prerequisites for members of the WAAF seeking to work as plotters or Filter Officers in the Filter Room. I had the privilege of serving with this special group This secret section of the RAF's defence programme in World War Two has never been given the recognition it deserves. Nevertheless, it was one of the greatest aids to protection of Britain and to our air operations of the whole war. The reason few people today have heard about this is the extreme secrecy which the personnel maintained about their work and its importance. Only in recent years have the restrictions been lifted and wartime members of this close group been freed from the silence imposed upon them. The work done by the airwomen plotters of the Filter Room, the Movement Liaison Officers and the Filterer Officers who were responsible for calculating and rectifying the position, and identifying the hundreds of tracks of hostile and friendly aircraft leaving and approaching the coasts of the British Isles, was vital. It is time that their valuable contribution to the battle in the air be recognised. The Filter Room was the nerve centre of the Radar system. It received information from the many Radar stations which formed a chain of protection around our coasts. This information, due to the early primitive forms of detection equipment and the possible human error of its operators, needed to be instantly corrected, co-ordinated and displayed on a huge map table of the area concerned, in a form suitable to be passed on to the Operations Rooms. Without this essential link, the Radar information at that time could not have been used. We have all seen the cleaned-up or filtered information being used in the Operations Room where WAAF Operations Room plotters move coloured arrows around a map table,using a long pole-like contraption. It always appears so peaceful and bears no relation to the hectic activity occurring in the Filter Room. 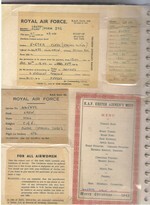 From this information, orders were given by the Senior Officers observing from the gallery above the Ops table, for air raid warnings to be sounded in threatened areas, fighter squadrons to be scrambled, incoming hostile aircraft be intercepted and returning bomber aircraft in difficulties monitored. This allowed air-sea rescue boats to be directed to their assistance, should they ditch. The ack-ack gun sites, Observer Corps and barrage Balloon stations also relied on the information provided by the Filter Room. The country was divided into seven Fighter Command Groups, including Northern Ireland and the Scottish Islands and there was a Filter Room for each. These were manned for twenty-four hours daily from the commencement of hostilities until after peace was declared in Europe. Personnel were formed into four watches. Sometimes it was impossible through illness or shortage of trained personnel to maintain this and a three-watch basis was instituted. This meant leave was impossible and other than eating, sleeping and working, there was little time left. particular station! Working conditions were often difficult and unpleasant. Many of the centres were underground where ventilation and heating left much to be desired. The pressure of work depended upon the amount of aircraft activity and also the region involved. Naturally the northern areas were not as busy as the Filter Rooms covering the coast from the Wash to the Isle of Wight, (11 Group), and the Isle of Wight to Wales (10 Group). The weather too was a key factor in the activity to be expected so meteorological advices were posted constantly. The requirement for the Filterer Officers to have quick reactions was patently obvious. They had to sort out the correct position of the aircraft from the various overlapping Radar station plots which covered the same aircraft responses. In addition they were required to estimate both height and number of aircraft, as well as direction from information given. For this to be successful, they needed an intimate knowledge of the siting of the Radar stations in order to judge the accuracy of their information. All of this had to be done with great speed as the aircraft themselves were constantly moving on to new positions. It was found that male Filterers, mostly well over thirty years of age were far too slow during periods of intense activity and they had to be removed from the table! For the displayed information to be of value to the Operations Room, it had to be as up-to-date as possible. This meant that in times of the greatest activity, a Filterer Officer must estimate and display salient information on up to fifty different tracks within a minute. The mental stress and physical strain were intense under these conditions and when the personnel came off watch, whether officer or airwoman, tension was invariably high. Throughout the meal supplied when coming off duty, the atmosphere was almost hysterical as they gradually unwound. Quite often however tired, sleep was impossible. On the whole, it was amazing how few buckled under the strain. They all realised the importance of their work and it took a really major illness to prevent them from appearing for duty. However, subsequently, time has taken its toll of some amongst that small group. There have been instances of suicide, of recourse to alcohol in later years and bouts of deep depression. This is not to be wondered at when one considers that whilst filtering the tracks of the bomber squadrons on operations over Germany or plotting fighter sorties against incoming hostiles, these young women knew that their own husbands or sweethearts were amongst the aircrews. They would count with trepidation the numbers of the returning Allied aircraft. The mixture of backgrounds amongst the members of the Filter Room officers was amazing. Most of the senior male officer hailed from the Stock Market where they worked as jobbers and brokers. It was an inspiration on the part of the RAF to choose these men for the positions as Controllers and Movement Liaison Officers. All personnel involved had to have quick reactions, mathematical ability and have lasting energy. The women chosen ranged from psychology and science students, young actresses, county debutantes, grammar school high flyers to daughters of famous people - novelists, painters, musicians and vicars. But they were without exception dedicated to their work. Many friendships were forged under these conditions and remain close until today. Now the strictures of secrecy have been lifted, it is surely right that their dedication should be recorded. The importance of their work in the defence of Britain together with their contribution to the successful invasion of Europe and the ultimate overthrow of Hitler's forces should be made known. Was my mother the youngest WAAF ever? My mother Oliver O'Brien (nee Grace) was born on June 6th 1927 in Edmonton north London. Apparently she lied about her age and joined the WAAF aged 14 yrs. I know she worked on barrage balloons and was sent to Singapore (I have photos of her at Changi). Is there some way to corroborate this story as I am drawing a blank trying to research archives? Kind regards. I was in Local Service WRAF in 1958. I was a controllers assistant. I reached the rank of SACW .I did my basic training at RAF Hawkinge. I was one of the first to join the local service. My number was 2996004. I married an airman who was the runway controller. My married surname was Schofield. I loved my job but had to leave to have a baby. I do wonder how my old friends are. Towards the end of 1940, my husband was enlisted into the RAF..I decided to store our furniture, let the house.. and join the RAF. The nearest recruiting office was Bath, and I reported there. A male officer asked me a whole lot of questions – spelling, mental arithmetic and IQ; he told me that I would receive my papers and a railway warrant in a few days. I did – Gloucester was the destination, and it was May 2nd 1941. Arriving at Gloucester, there were RAF police calling “WAAF Recruits” – that was me! We were taken to a RAF lorry, I had my first experience of climbing up the tailboard, also my first lesson – be first up the tailboard to get a side seat – alas, I was on a form down the middle! Arriving at Insworth Lane, we were checked, shown into huts of about 20 beds, 10 each side. On each bed were three square mattresses known as “biscuits”, 3 hairy air force blue blankets, 2 unbleached sheets and a roly-poly pillow filled with hay. A sergeant entered, “stand by your beds and listen to the rules”. Lights out by 10 pm, beds stacked, washed, outside by 8 am, ready to march to the Mess. All a bit strange, but most of us slept well. Morning arrived, we found the ablutions, nothing private here, stacked our beds blanket sheet, blanket sheet, 3rd blanket folded long ways wrapped around with the ends underneath all folds to the front, it did look neat when done properly. Sergeant tried to teach us to “get fell in” and find our left foot to start our first march to the mess. The next few days were a test on our stamina, drill, march, fitted with uniforms, vaccinations, tests on our brains – oh those blistered heels, NAAFI sold out of plasters, we were all limping. About my fourth day, one morning among the sea of faces, I saw one I knew. She saw me at the same time. We fought our way together – she had just time to say “try to be a plotter”. I don’t know what it is, but I am to be one! My interview time came, two male officers sat behind a desk. I boldly said “I would like to be a plotter”. “Do you know what a plotter is?” they ask. A little less boldly I said “No, but I’ve a friend who is going to be one”. Questions followed some more spelling, maths. “Would you be calm under fire?” I said “Yes”, was passed. “Clerk, Special Duties” was the title, we, nor anyone else, knew what it was! We passed it all, were soon on a train to Leighton Buzzard, and finally arrived at a Plotters School, a building resembling a prison. Our first morning we were shown into a large room full of maps and telephones. We had to swear on the Bible we would never talk of our work, or make any notes; we began to feel collywobbles at this stage. The teaching did prove very intensive, especially as we could not make notes – we lay in bed testing each other – I cannot remember any free time at all, but never thought of giving up. At last a list was presented of stations needing plotters; these were fighter command operational stations. Most girls wanted to be near London, so Colerne in Wiltshire did not receive many names. We were pretty sure we would be going there, and we were. Colerne was a fairly large station of concrete blocks. We were shown into “B” Block. Outside our window, a runway run to a hangar. We were soon to get used to Spitfires, Hurricanes and Mosquitoes taxiing by to the hangar; some girls wore earplugs. We were both on “A” Watch, and were to be called the “heavenly twins”; we worked side by side, slept side by side, ate side by side, went on leave together, and were always spoken of as “Rudd” or “Hill”. Christian names were seldom used. The “Ops” was underground, most of them were, sentry at the door, code number given, which was changed each day. We left our coats, caps and items in the cloakroom. Filed into “Ops”, collected a headset from a row of them, and plugged in next to the WAAF we were taking over from. When you were plotting in rhythm, she would unplug, disinfect her headset and hang it on the peg. Headsets were adjustable to fit snugly over our ears. Plotting rods were adjustable in length and magnetic. A speaking tube hung round our necks, we were given a position to plug into, and would be responsible for information for that section. Every aircraft in the sky should be shown on the table, as were all air balloons. We were very happy at Colerne, but the time came when we were on the move to Middle Wallop. For some reason unknown, we never warmed to Middle Wallop, so welcomed the call for plotters at Exeter, and volunteered top of the list. Transport awaited us at Exeter Central and we were driven about 6-7 miles the other side of Exeter City, a pretty village called Pinhoe. Pinhoe was small, with two pubs – “Poltimore Arms” was the one the Army favoured, “Hearth of Oak” the RAF – you never found a mix in either pub. Devon was noted for its cider. I didn’t know how strong it was!!! After an evening of many glasses, I was so ill the next morning that I could not move from my bed. Nothing to be sick in but my tin hat!!! The girls kindly emptied it for me, and I have never tasted cider since that evening. And how they are sweet! We took pride in our hut. Each polished the floor space under her bed, we stacked our bedding neatly, kitbags with everything we owned, like sentries to the left and head of each bed. We put our shoes on outside, or walked on dusters, the floor shone like a sheet of glass. The “Ops” building was a short march away, a very busy “Ops”. We would start plotting the “Germans” from the coast of France over the water to our shores, 50-100-500 at the time; our table was full, plots came fast and furious. Each plotter was responsible for a section of the map, colour of arrows changed each 5 minutes – Red, Yellow, Blue. Never kept on Red when you started Blue, to be exactly accurate and on time was vital for our controllers to send our fighters on the course we were plotting. We were very aware of our responsibility; I realised why the interviewer asked if I would stay calm under fire! No room for nerves on these nights! Airfields, especially “Ops” were a target, they did get some, and WAAF lost their lives. We used to say “if our name is on it…..” I can never remember being frightened – no good to be! Great excitement – the “Yanks” were here! Right in our “Ops” putting up their own plotting table. Young, fresh, smart. Night duty was never the same! How exciting life became. Invitations to their dances were frequent – transport provided, masses of food and drink, we tasted chocolate as never before, we lived life to the full, learnt to Jitterbug, taught them to waltz and foxtrot. While at Exeter, we were sent to Brixham on a course, to see how we got our information. Radar stations on the edge of the cliffs were even more secret; we had a code number or word given each shift, changed each time. We sat in front of a television screen; a needle was revolving picking up information on a grid. It was very tiring on our eyes as, except for the screens, the room was dark. We were pleased when we returned to Exeter. I..made the mistake of going AWOL. I was caught, put on a charge and posted to Kirkwall, Orkney. Kirkwall did not have a lot in its favour for me – no trees, windy, bleak, could hardly understand the language, but I was there to stay. I reported in, was given a bed, a watch I would be on – they were on duty at the time. I got unpacked, managed a bath, met them as they returned from duty, and slept well as usual. Next morning I joined them for breakfast, later on parade to march to “Ops”. Two plotting tables to learn, one filter for shipping subs. A new area, too. About two months later, as I was walking through the camp I spied a WAAF Officer coming my way. As I prepared to pass and salute her, we realised we knew one another as she had been at Exeter. She asked me if I was happy at Kirkwall, I said “yes, but I do miss Exeter”. “Leave it to me” she said. I did not think much about this, but sure enough a few weeks later my papers came – a posting to Exeter. I never saw her again to thank her. It was drawing near to D-Day. We noticed extra activity around the coast, and one day we were called to a meeting to be told that we would be confined to camp, all letters and phone calls monitored and censored. We passed the time mostly playing cards when off duty. We had thoughts, too. Back to civilian life. We had lived over 4 years with just a kit bag, 2 sets of uniform, rules to live by. I had a husband to meet whom I had not seen for 4 years. On his return to this country, he got leave. I did also. We met on Bristol station. He had never seen me in uniform, but there I was in blue like him. We felt like strangers. A lot of catching up to do. I joined the WRAF in February 1967 and was sent to RAF Spitlegate for my basic training. Our Drill Sargeant was someone called Sgt Samson who was all of about 5ft nothing but with a voice on the parade square that could shake the windows in their frames but she had a heart of gold, you just had to find it. It was the best thing that could have happened to me. I joined the (now defunct) WRAF Band and went to RAF Uxbridge. When they decided to disband (no pun intended) the WRAF band I changed trades and went for Air Traffic Control training. Back to Spitlegate for six months and then to RAF Shawbury to train as an Assistant Air Traffic Controller. In 1968 I was posted to RAF Northolt and went on detachment to the Royal Tournament at Earls Court. In 1969 I was posted to Cyprus for 18 months and then back to Blighty to RAF Waddington and those fantastic V Bombers. I worked in the Operations Centre and even managed to get permission to go on a RECCE flight up to Scotland and back in one of the V's. There is no finer sight than six V Bombers doing a scramble take off during a Taccy Val (Tactical Evaluation Exercise). It would raise goose bumps, magic. This is what I recall mum telling me. Mum was then Miss Muriel Dora Baxter from Liverpool, born 1918, who joined up after her home was bombed in the Liverpool Blitz. She told the story that when she went to the RAF recruiting office to join up she initially declared her job as "in an Ammunition Factory" at Birkenhead. The recruiting officer said that if he put that she would be refused entry as it was a "reserved occupation". She said that she really wanted to join the RAF, so he kindly put her occupation as "Typist". She also stood on 'tip toes' when measured as she was not quite 5 ft tall. After her basic training and the recruits were being allocated jobs, she was told to report to the Typing Office. Not being able to type she told the Officer that she didn't want to go there as she had joined up to have a change of job, so she was then sent to the Aircraft workshops, much to her relief. She told us that her job was to remove, clean, log and replace Sparkplugs on a number of different aircraft during her RAF career at Warmwell, Ibsley & Zeals. She also said that the WAAFs all had to go up in a Tiger Moth to help them understand the importance of doing their jobs properly. The pilot was recovering from "burns" having been previously shot down. She said that by the time her turn came to go up, he was either getting more brave (or perhaps bored) because he "looped the loop" with her in it much to her terror. She mentioned being billeted in a large country house at one time, though I don't know if this was Warmwell or the other stations she served at. She met my Dad, Edward Potter, a London man later when transferred to RAF Zeals where he was a ground gunner, before he transferred to the Coldstream Guards and going to Italy in 1944. They married in 1943. I joined the WRAF at Wilsow 1952. A late starter at 21. I followed in my father's footsteps. He was a VR at the start of WW2 and I am pleased to say he did come back and was there to watch me passing out. Initially I was a telephonist and stationed at Gloucester, working at Eastern Ave. I enjoyed every minute and later married a Physio before being stationed in Cyprus and Aden for another 15yrs. The attached photo was taken at Padgate where we had all just visited the dentist. Sadly the only name I can remember is the girl with glass kneeling next to me. May - she came from Belgium and by sheer coincidence when she came home with me for a weekend recognized my Dad from when she was with her father ,an ambulance driver, who made friends with Dad. I often wonder where they all are. Being now 79, is a long time ago. But it would be lovely if anyone recognizes a face. I served in the WRAF for 12 years from 1975 to 1987. It was the best thing I have every done. The pride I felt when I did my passing out parade at RAF Hereford was absolutely amazing, the smart number one uniform and ''bulled'' shoes - magic. 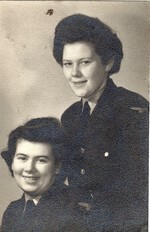 The WRAF helped me broaden my horizons, gave me a good trade and training, enabled me to go abroad (two years in Cyprus and later on a detachment in Nairobi) and last but definitely not least was responsible for me meeting my husband (an army Sergeant) on my return from Cyprus on the airfield at RAF Upavon. We married in 1981 and are still going strong now. The military discipline stays with you for life, the number of ex servicemen/women who go into civilian uniform jobs (like police/ambulance) is extremely large. Nellie Kendall was in the WAAF from 1940 to 1945. She joined up at the age of 20, shortly after marrying John Kendall, himself in the RAF. John was abroad for most of the war so Nellie felt she could support the forces by joining up. Here her daughter recounts some of Nellie’s wartime tales. The stories she has told me mostly relate to Bylaugh Hall in East Dereham where she was based for a number of years. The huts were apparently quite large and each new cohort seemed to have “bagged” an area or corner for girls from similar parts of the country e.g. the “Yorkshire” group or the “Scottish” group. However, they all seemed to get along well and helped each other. My mother occasionally worked for Lady Seaton and was also allocated to the Officers’ Mess and had to get familiar with the drink each officer preferred: gin, whisky, vodka all seemed to be available there. She said that after a night bombing mission those returning were allowed one egg with their breakfast (a treat), after a confidential debriefing. Once, a returning crew were followed in secret by a German bomber which scored a hit on the airfield at East Dereham. The female office observing the return was hit by shrapnel and her watch was embedded in her wrist. My mother said many jokes were played on new arrivals, such as asking them to hold the ropes on the barrage balloons (to keep it grounded) only to find themselves pulled a foot or two off the ground and not daring to let go of the rope. One of her abiding memories was the extreme darkness of the blackout in an open country area: stumbling along paths and roads which one was totally unfamiliar with, with very few landmarks. The girls still tried to be glamorous, despite privations and uniforms. She said they would take their standard issue black leather shoes, heat up a poker on the open hut fire and spread black shoe polish onto the leather to give a patent leather effect. Stockings were thick wool, but occasionally silk ones were received from the American forces. Often their attempts at glamour were spoiled by the attacking midges prevalent flat Norfolk broads. My mother missed my father a great deal and there was a period of 2 years during the war when they did not meet up at all. However, they wrote regularly and letters appeared to arrive without too many problems. She was pleased she did not succumb to the attentions of a superior of hers. He was relocated from East Dereham and his very next station was my father’s hut in Italy: a small world! He told my delighted father what an honourable wife he had back in England who stayed true to her husband during their long absences. They spent a few months together when they were both stationed in Liverpool but had to wait until the war ended, demob and return home before they could set up home together. They were happily married for 41 years. Susan was a WAAF Flight Mechanic between 1941 and 1943. She was in one of the first groups of women to qualify as flight mechanics in the WAAF. Here she describes her training and the often terrible conditions in which these women worked. Our training camp was on a hill near a town called Hednesford, near Rugely in Staffordshire, and here we spent 6 months doing a high pressure course learning the intricacies of aero engines. We were 30 students to a hut, and each fortnight we had an exam, failure to pass this meant you were set back a fortnight, moved to a different hut and lost your friends. But if all went well you stayed with those 30 girls for the whole 6 months of your training. Luckily, I was one of the latter. They called me “Ginge” on account of my red hair, and I quickly lost my middle class accent. It was a terrible winter, with snow several inches deep. We were so cold in our wooden huts we often shared a bed to keep warm. We slept in our underclothes and wore our pyjamas on top. The way to the ablutions was in the dark along a narrow track of sodden duck boards, clutching towels and sponge bags and running as fast as we could to escape the freezing wind. They issued us with men’s trousers to keep us warm, but there were difficulties with these in that their fly buttons were made of tin which cut through the thread securing them, so that when we sat down the strain was too much for them and you could hear the buttons pinging across the classroom. We were also supplied with – not boots - but pieces of brown paper to wrap around our legs. Later we were issued with proper women’s battledress. Classes started at 7am. We were often so tired that we nodded off for the first hour or so. This was the reason that my knowledge of magnetos had to be hastily revised before the next exam. One night we ran out of fuel for our Tortoise stove, I and four of the girls upended a table and, sliding it along the snow, we raided the officers’ store, filled the table top with coal and slid it back to our hut. Remember, the penalty for this had we been caught, would have been dire. After we all passed our exams we were posted to Edinburgh where we were billeted in a beautiful country house, each with our own room, in the hills about Costorphine Zoo. We were transported each morning to Turnhouse Bomber Command in a luxury coach. Arriving at Turnhouse the aerodrome looked so beautiful, with aircraft like great birds tied down in the early morning sun. I can remember when we entered the hangar we received lots of ribaldry from the men. They would not let us near the aircraft, instead giving us carburettors to wash out. But it didn’t seem very long before the men were posted overseas and the hangar was “manned” by us women, with the kindly (male) Warrant Officer in charge of us. The hangar was where major services took place, sometimes with the engines being lifted out on hoists. After a while I was sent to a place called Station Flight, a small building on the outskirts of the aerodrome. Our job here was to bring in visiting aircraft (with bats), refuel them, perform whatever short service was required, and if necessary tie them down for the night. I was the only girl among 3 veterans of the Battle of Britain, all of them injured in some way. They were not pilots; they had been “ground crew” flight mechanics. They were kindly men and taught me a lot about the different kinds of engines that came in., and which I would service as and when required. I used to ride on the “bowser” out to the aircraft, climb onto the wings and fill the tanks with high octane fuel, sometimes with a cigarette in my mouth. Another extra-curricular job I had was to help pilots into their parachutes, which was often embarrassing for both of us. Yet another was to lie on the tailplane of Spitfires while they were run up to maximum speed so the magnetos could be tested. This job was so cruelly cold that I quickly bagged the job of running the kite up myself. There were some days when the aerodrome was blanketed in fog. On these occasions we played solo. I was still only 18 years old. She was a dentist qualified in 1939,and went into the Air Force in 1942. She was not in the WAAF , but was a flight lieutenant in the Royal Air Force due to her profession. This was very rare as there were few women dentists at that time. The ultimate accolade that she got from her Commanding Officer was that,'she was a very popular dentist , and none of the men had asked not to see her because she was a woman' !!! She met Flight Lieutenant Johnny Pinder in 1944 while he was also a Dental Officer,and they married in February 1945. He was involved in a dental caravan service immediately after the Normandy Landings on D- Day. She never doubted he would come back. Leaving home to join the WAAF proved to be an easy decision for me. 3 of my sisters worked on Spitfires at the J Sankey Co factory in Hadley and my eldest brother Tom (now 93) was already in the RAF. It was a good feeling to volunteer and be a part of their world. My basic training was a RAF Wilmslow 2PDC, my time there was a good settling down period, familiarising myself with service life. Eventually I went to RAF Weeton near Blackpool for RAF/WAAF Police training. This was an experience I have remembered over many years as I covered central London during the V1 (doodle bug) and V2 bombings. Our Headquarters was at Princess Gate Court, Exhibition Rd, South Kensington and the daily drills and inspections took place at the rear of the Royal Albert Hall. Our duties were to cover all rail stations, the underground and much of the West End. We even visited hotels to look for WAAF who went 'Absent without leave' (AWOL). This included Piccadilly Circus where we went for cover during raids. There were cells at HQ and we all took it in turns to be duty jailer. This gave me a good experience of life and made me grow up very quickly. The best memory however was to be party of the victory celebrations at Picadilly Circus and Trafalgar Square on VE Day and also taking part in a victory parade. The end of hostilities brought my WAAF service to an end, but the memories of those years have lasted all my life. On leaving the WAAF I married my husband who had served throughout the war as a navigator/ observer on Wellington bombers with 221 Squadron, Coastal Command. So the RAF was very much in the family. At the start of the war I wanted to go in the WAAF. I left my home town of Wolverhampton in the beginning of May 1944 to go to Wilmslow for one month training. I arrived with other young women from all parts of the country. We were assigned to a wooden hut, with about 40 beds. The next day we went to the stores, to get our uniform and all our kit. We were then given brown paper and string to send our civvies home. We were shown how to lay out our kit for inspection, how to make our bed with 3 biscuits (these in place of 1 mattress), and how to stack blankets and pillow, etc, on our bed. Most days were taken up with marching, all getting into step together. This we called square bashing. There was an American army camp next to the WAAF site so we were not allowed out of camp. I was posted to Driffield in the beginning of June, 1944. We were met at the station and taken by RAF lorry to the WAAF camp, just on the outskirts of the village. We were in nissun huts, with a coke stove in the middle, about 24 beds. Toilets and wash places were in a concrete block outside. It was bitter cold in the winter. The 1st day we had to be up and ready to go to the main camp, about two to three miles away, by lorry, at an unearthly hour of 7am. We were taken to the officers mess, to learn about our jobs, etc. I palled up with Joyce, from Oswestry, and we were working in long wooden huts, about 30 rooms. Mostly in these rooms were Australians, and a few New Zealanders. They were young aircrew, 1st flying Halifaxes, then Lancasters. My job was to collect a large can of tea, walk from the officers mess to the huts, about a 10 minute walk, and wake the young officers at 8am with tea. Later in the day we would make their beds, cleaned their rooms, and pressed their suits. We used to polish the floors with a bumper, a long broom handle with a brick wrapped in felt. We would slide this back and forth over dollops of polish. It would come up great! Sometimes we would see an empty bed and know that an officer wouldn't be returning from ops the night before. Sometimes, after finishing work on the main camp, we would go back to WAAF camp, and walk into Driffield. It wasn't far. One of the church halls had been made into a place where we could get tea. I got chatting to a Sgt. Air Gunner from our camp. He told me he had 2 brothers and 7 sisters and came from Lincolnshire and his birthday was the same as mine. He was a year older. We went out together a few times then he didn't come back from a trip over Germany, October 9th, 1944. I was so upset. At 18 life seemed so hard. I wrote to his parents and visited too, and we had a life long friendship for 54 years. I'm still in touch with the family. When VE Day came May 8th all I remember now is walking through Driffield with someone called Frankie. After VJ Day August 15th, 1945, 466 Squadron was moved to Bassingbourne and by September I was posted to RAF Crosby-on-Eden, just outside Carlisle. I didn't settle there and put in for an exchange posting to Brampton, but was sent to Syerston, between Newark and Nottingham. I stayed there for 18 months until I was demobbed. The WAAF quarters, in Syerston, on the main camp, were brick built barracks, 20 to a room. The officers mess was over the main road. There was hardly any traffic in those days. My duties there were the same, but with the addition of telephone duty. I was demobbed September, 1947, but found life at home very quiet and missed the companionship of WAAF friends. If I hadn't got back with my boyfriend, I would have rejoined. About 10 years ago, my husband and I had a day out at Newark and went along to the camp. The officers mess was very run down. We rode up to the main camp and saw it was being used as a glider school. It's a long way to go back 65 years! Thank you for giving me the opportunity to remember and write it down. Mum joined the WAAF in the very early days of the war. Her father thoroughly disapproved. The photo shows her with corporal stripes, but she did later become a sargaent. Because she was tall - 6 ft 1 inch, she was always the marker when there was any marching to do. Ivy started out with 40th (Hunt's) Company, but was posted to Andover RAF Station in November 1939. She met my Dad here. He was posted abroad in 1942, and took part in the Africa, Italy and French campaigns for the next 3 years. Ivy was eventually posted to Bomber Command at High Wycombe. She worked on the switchboard, working day and night shifts. Whilst there she met Mr Churchill, Bomber Harris and the King. In the very early days of the WAAF they didn't have proper uniforms, and were issued with men's greatcoats and shoes! Ivy was fine with the shoes as she had size 8 feet. Also the women had to sleep in huts with only small stoves for heating. It was very cold and Ivy suffered very badly with chilblains. Ivy was throughout her life very proud of her WAAF service, and continued to talk about, and tell stories right up until her death last year at the age of 93. This shows my mother, Peggy Meek (the late Mrs Priestley) of 207 Squadron, photographed at RAF Langar for a US magazine. One of my mother's duties as a driver was to drive the crews out to their aircraft. They often left her mementoes and letters for safekeeping, 'just in case'. Another task was driving out trailers loaded with 'cookies', bombs. This picture shows her helping to prime them prior to loading. Dangerous work. A few days after this another WAAF and the Flight Sergeant in the picture were killed when a cookie exploded prematurely. My mother met my father, Harry, still going strong at 86, while on 207 Squadron. They conducted their subsequent courtship on 207 Sqn, 'Semper Paratus', with the aid of my father's weekly 'aircrew orange' . He would save it to share with her whenever they could meet.... but if she was late he would often have eaten it!!! Another of her duties at one airfield where the end of the runway was boggy land, was to drive a vehicle, in the back of which sat an airman signalling in the incoming Lancasters returning from their 'Ops'. There being no runway lights for obvious reasons a badly damaged Lanc limping home pancaked onto her vehicle, killing everyone else but miraculously pushing my mother out through the front windscreen. As a beautiful young woman she was left with hundreds of tiny slivers of glass in her face and her top lip all but severed. However, her luck continued. The famous plastic surgery pioneer, Archibald McIndoe, was visiting the base and personally attended to her when she reached sick quarters. Her lip was re attached with only faint scars visible in later life. I supposed not many people could say a Lancaster had landed on them but they lived to tell the tale! My parents married in 1944. In August 1960 I joined the Local Service WRAF at RAF Hawkinge. I was one of many women who joined this branch of the WRAF. It was brought about by the ending of National Service when a shortfall in recruiting was expected. After 3 weeks square bashing at Hawkinge followed by 12 weeks training as a teleprinter operator at RAF Compton Bassett I was posted to my nearest unit to home which was the Air Traffic Control Centre at Barton Hall nr Preston in Lancashire. I lived at home and travelled every day to work on RAF transport. We could only sign up for an initial 2yrs followed by extensions of 1 year at at time. In total I just served 3 before getting married and being posted with my husband to Germany. All the perks of the Air Force were available to me e.g. sport facilities, subsidised 10 pin bowling, free camping weekends etc. It was the best time of my life and it is where I met my husband who was also in the RAF. I am still in touch with many of the girls who served at Barton Hall as I am the secretary of the unit's reunion group. There must have been thousands of Local Service WRAF, as one of my friends was only demobbed in 1976, yet I can find no reference to it in WRAF history sites. Found amongst my late aunt's possessions. (Flt Sergeant Nancy Scamp) Memories already on site. This is not so much a story as an enigma, the photo is of my great aunt Amelia Dixon who was born in 1881, so at the time this picture was taken, in 1918, she must have been around 37 years old ! How did she come to be in the air force, what did she do, was she a widow by then? Where was she stationed? I would so love to know more about her. I had been in the cadets for two years, but when I reached the age of eighteen I secretly longed to join the W.A.A.F. Mother said, "If it means so much to you I give you my blessing." Within four weeks I had volunteered and was on my way to Wilmslow in Cheshire. February 14th 1944, after basic training we all sat an IQ test followed by an interview with the W.A.A.F officer. She asked me if I would like to train as a carpenter. That came as a big surprise. I did pass the carpenters course at Weeton near Blackpool and went on to serve on five different airfields through my four years' service. But the one that really stays in my memory is R.A.F Kemble in Gloucestershire. At the beginning of 1945 the war was going well and the end was in sight. At that time I was stationed at R.A.F Wymswold. I and another W.A.A.F were sent R.A.F Castle Donnington to make bedside lockers for the W.A.A.F on the camp - the material being bomb boxes. We finished the work and returned to Wymswold. A posting came through for one carpenter to be moved to R.A.F Kemble. I volunteered to be the one to go. It was a new unit, the Transport Aircraft Modification Unit or T.A.M.U. Trades personnel from different parts of the country gathered together for this special work fitting out Dakotas, the planes used to transport paras and equipment “although we were told nothing at the time”. Finally when finished six months later we knew the reason. We fitted the Dakotas with oxygen racks, stretchers were added, first aid, seats and other equipment. The war ended and we were told they were fitted out to bring home the wounded and prisoners of war but the first one to be modified was different. It had no camouflage and the rumour was that it was intended for Winston Churchill we never found out but it was nice to think that we had worked on it. I served another eighteen months moving on to R.A.F Netharavon, the last six months R.A.F Honnington, Suffolk, a very happy camp. I was the only W.A.A.F in the workshops and I remember my last job. I helped to build a portable bar for the Sergeants Mess and on a visit to R.A.F Honnington in the early 90s I was very surprised to find it still there in use. I am a founder member of the W.A.A.F Association which over the past twenty years has been a great success. This is just a small look into my short W.A.A.F life, the comradeship was the best in the world and I will always look back on the time I wore my “air blue” with all my happy memories. 2107569 ACW Ainge served from 1944 to 1947. My father’s cousin, Nancy Scamp (891134) was one of the first women in charge of a barrage balloon site during the Second World War, somewhere around Sheffield. 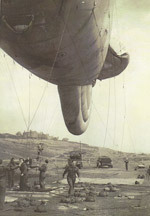 There is a photo of her and her balloon in ‘Roof over Britain’ opposite page 81, pub 1943 at 9d by HMSO. Nancy sadly died earlier this year but gave me handwritten notes that went with a talk she regularly gave about her experiences as a WAAF.She had volunteered early in 1940, as did many girls eager for adventure. trange questions when she thought she would become a plotter or a clerk. She was actually to become a balloon fabric worker, hence the sewing! Making and mending balloons was rather a smelly job, the silver solution applied at the end smelt like nail varnish and everyone had to drink half a pint of milk after each shift. Eventually volunteers were asked to go on a 10-week course to see if women could replace men on operational sites. The men said it was impossible but not so, and 100 girls were chosen out of 500. They were issued a new uniform – boots, heavy socks and boiler suits, all men’s! The girls had to learn to launch and deflate the balloon in all weathers and by night as well as by day. They had to move heavy sandbags and bed down the balloon if the weather was bad. Life on the site was quite basic and all 12 girls just had to learn to fend for themselves. Water came in dustbins and cooking was on a paraffin stove – some girls could not even boil an egg but they soon learned. Subsequently Nancy became a sergeant instructor to teach people how to man a site, but when the danger from enemy bombing was less, she went on to radar plotting. The end of the war saw her going back to civilian life – what a change. 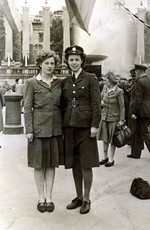 Nancy Scamp served in the Royal Air Force from 1940 to 1945. I spent 6 and a half years 93 - 99 as a WRAF Dental Surgery Assistant, I never had a detachment from my main unit but spent many enjoyable days and weeks overseas doing sports including athletics, hockey, canoeing, skiing, and the latter was where I met my husband who is still serving as RAF Regiment. We met at RAF Granton-on-Spey, Scotland during a skiing trip. Having had experience in the RAF it certainly helps understand the conditions he works in why there are Ops such as Afghanistan. I love the RAF way of life and the vast experiences it has given me as an individual and as a family over the past 16 years. "I don't think service life coarsened me or those I knew... it did broaden my mind." "That's a lot of widows you'll be responsible for." "One of the best safeguards is to enlist the protective instincts of decent men by making them feel that the women belong to the same organisation." "...To admit women (into ground combat roles) would, therefore, involve a risk with no gains in terms of combat effectiveness to offset it." "I was going to say 'welcome', but all of us in the regular Service throughout the war and since have always, I think, regarded the WAAF as very much an integral part of the Service." "I cannot believe that, with our present critical shortage of trained aircrews... we are justified in spending a penny or a man-hour in training WRAF officers to fly."